Culver City Film Festival celebrates 100 years of Culver City, screening over 100 independent films from around the world. Who referred you to the Culver City Times? Culver City, CA, November 20, 2017 --(PR.com)-- During this occasion over 100 independent films will be screened in celebration of Culver City's Centenary. Submissions are now open for short and feature films both narratives and documentary from any part of the globe. 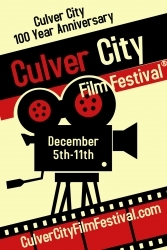 Jon Gursha, the festival director Culver City Film Festival, is highly delighted to announce that the fourth annual Culver City Film Festival will hold from Monday the 4th to Monday the 11th of December 2017 in Culver City Los Angeles County, California.